Coming soon to Vancouver’s West Side real estate district! 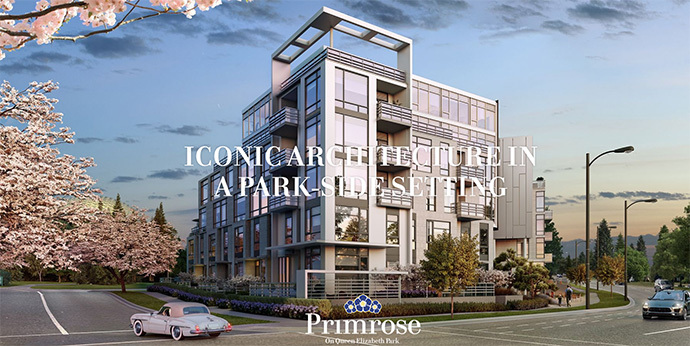 Located at 33rd Avenue in the prominent Cambie Street corridor on Vancouver’s West Side, Primrose condos will offer a limited collection of 1, 2 and 3 bedroom homes and townhouses nestled on the edge of Queen Elizabeth Park. Register today to receive the latest information on this blossoming new West Side Vancouver condo project brought to the market place by Transca Development. Ideally located in the Vancouver west side district, Primrose on Queen Elizabeth Park provides immediate access to this urban oasis and all of its amenities in addition to easy access to downtown Vancouver as well as YVR airport via the SkyTrain. As well, the prime West Side neighbourhood gives you an excellent school catchment area for all levels of education. The architectural icon at the Vancouver Primrose condos is located at the crest of the Cambie Corridor and is designed by award winning GBL Architects. The master planned development features Hapa Collaborative Landscape Architects that pay homage to the history of QE Park with quarry stone incorporated into the landscaping of the property. The Primrose Vancouver West Side condos will feature a well equipped fitness centre in addition to secured underground parking with electric vehicle charging stations. Select homes will have patios and roof decks with gas connections and water hose bibs. The QE Park Primrose condos in Vancouver are of concrete construction and have the latest in rain screen technology. All homes have the 2-5-10 National Home Warranty. The West Side Vancouver Primrose condos feature 2 buildings separated by an outdoor breezeway that provides direct walking access into Queen Elizabeth Park. It’s an animated open air courtyard that will feature a café, plenty of 10 seating and space to gather with friends or family. The breezeway at Primrose condos will bring vitality to the area, adding a unique sense of community and social life to the park’s edge. Lush landscaping features trees and local plants, along with a preserved natural rock formation that evokes the park’s historic quarry, which was long ago converted into the colourful gardens we see today. There are 2 colour schemes offered at Primrose condos that includes Light (Gray) and Dark (Brown) designed by BYU Design group. The homes will have beautiful ultra-wide plank engineered oak floors and air conditioning. All homes have Blomberg washer and dryer and modern recessed pot lighting with LED lights. Roller shades are installed throughout the homes and privacy blinds in the bedrooms give you even more privacy! The kitchens at the Westside Vancouver Primrose condos will feature imported Italian contemporary cabinetry, quartz counters and backsplash, under cabinetry task lights and integrated LED strip lights with motion activated sensor. Other kitchen features at the presale Vancouver condos at Primrose on QE Park include: LeMans corner shelf system with lighting, polished chrome Grohe faucets, custom single bowl under mount stainless steel sink, and drawer organizers and recycling bins and a garburator. The homes at Primrose Vancouver condos will feature a fabulous appliance package that includes a 24” Miele fridge/freezer with integrated front panel to match cabinets, 24” Miele stainless steel gas cooktop, 24” Miele stainless steel oven and a 24” Miele integrated dishwasher with integrated front panel to match cabinet and Venmar stainless steel chimney hood fan. Two bedroom and larger homes at the Vancouver Primrose condos will feature 30” Miele fridge/freezer. The Primrose penthosues and homes that are over 1300 square feet will feature 30” Gaggenau appliances, a Hansgrohe pot filler over range, custom double bowl under mount stainless steel sink and peninsula kitchen island. The bathrooms at the new Vancouver Primrose condos include quartz stone counters, frameless glass surrounds in all showers, Grohe faucets and fixtures, Duravit under mount rectangular vanity basin, custom mirrored medicine cabinetry with integrated lighting, Hytec acrylic deep soaker tub, Kohler soft close toilet, polished chrome accessory fixtures by Kartners Accessories, polished marble stone tiled floors, shower base and walls in addition to polished marble stone slab shower curbs. 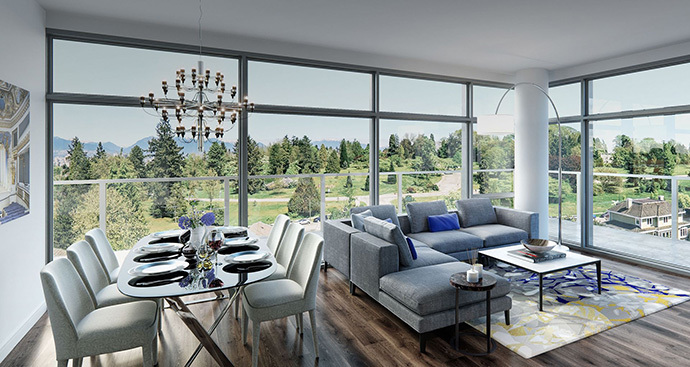 The interiors at Primrose Vancouver West Side condos offer open layouts and well-planned living areas that are a perfect complement to the park-side setting. The homes are optimized for picturesque views of the park, as well as the vibrant breezeway and familiar city skyline. Rooftop patios, generous balconies and a quiet courtyard provide places to gather and socialize in the open air, while expansive windows draw natural light and fresh air inside. “STATE OF THE ART SPACES DESIGNED FOR DAILY LUXURY FORM + FUNCTION IN PERFECT HARMONY”. 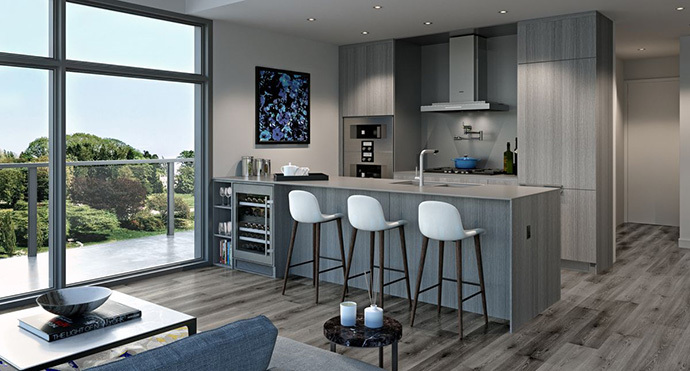 The kitchens at Primrose on QE Park feature a blend of intuitive, attractive and highly functional design to create state-of-the-art spaces for any level of cook. Fine finishes and rich materials define every surface, with standout features including clean stone countertops and backsplash and imported Italian cabinetry with ample storage capacity. Efficient and elegant European appliances at the West Side Primrose Vancouver condos include a stainless steel gas cooktop, wall oven, chimney hood fan, and in select homes, a steam oven and wine fridge for all your favourite vintages. From motion-activated lighting to an innovative pantry system, every element has been carefully considered to provide an elevated standard of luxury and comfort. LOSE YOURSELF. 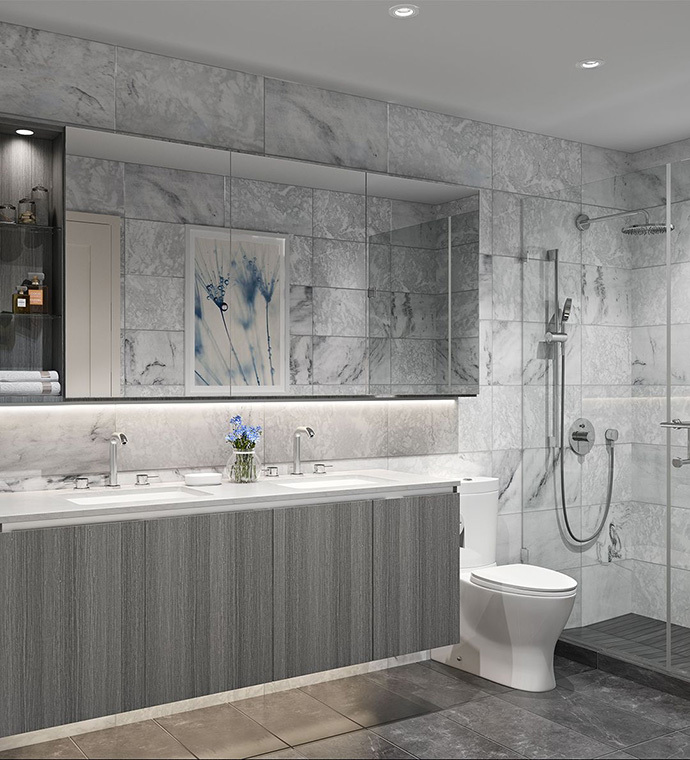 The clean, contemporary aesthetic continues in the opulent bathrooms at Primrose Vancouver West Side condos for sale, which are calming and composed. The sumptuous spaces include a frameless glass shower with polished marble base, rich stone countertops and backsplash, and modern European fixtures. A medicine cabinet with motion-activated lighting and sleek set of drawers make it easy to maintain an organized, uncluttered environment. All of these features come together to create a soothing daily escape. Primrose Vancouver condos is poised to become a landmark residence in Vancouver. 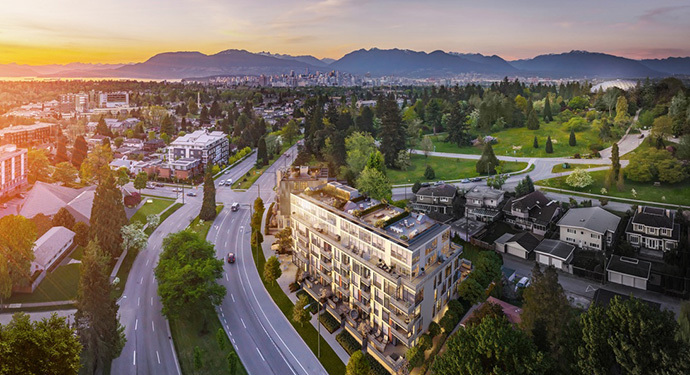 Situated next to Queen Elizabeth Park with a west side address where Cambie and West 33rd Avenue meet, its refined architecture will serve as a prominent gateway to the Westside Vancouver Cambie Corridor. Expressive materials, expansive windows and an architectural corner detail combine to create a unique sense of place, perfectly suited to the park-side setting. Primrose condos in Vancouver consists of a wide selection of homes in two buildings separated by an open breezeway that leads into the park. The buildings are angled to greet the roadway, offering an inviting curbside presence. Queen Elizabeth Park is a rolling topography of green open spaces and dense gardens, where lush foliage and brilliant flowers bloom in a continually evolving collage of colour. Think of it as your own private playground, with space to explore, picnic, play and enjoy the fresh air and healthy lifestyle. You’ll be surprised to discover all there is to do here. Primrose Vancouver condos offer a convenient central location that makes it easy to go anywhere in the city. You’re just steps from one of West Side Vancouver’s most beloved parks, with a range of recreation amenities and green space to explore. Getting downtown is easy too, just minutes away by car or SkyTrain. The surrounding neighbourhood provides close proximity to many highly regarded public and private schools for students of all ages. Nearby Oakridge Centre offers outstanding shopping and luxury brands, while Cambie Village is a walkable community with coffee shops, restaurants, movie theatre and more. When you need to go further afield, YVR International Airport and Richmond are just a short distance from home.